So I am learning that one of the biggest parts of gardening is changing your mind or discovering what works where and moving things about. So I need to let you all in on what been happening. This spring/summer finally arrived and my yard was looking so wonderful then I hit a little snag, I made a rather grand and I'll say it stupid mistake and nearly killed all my plants. As all of you that have been reading my Blog know I planted several hydrangeas last year and have been struggling with a large brick wall. 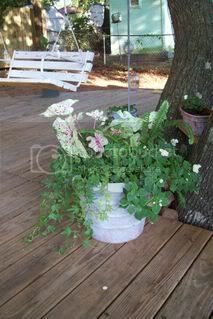 All my hydrangeas, including my Limelight Pan., were doing fabulous, plus ALL of the flowers I planted in pots. Well I'll just come right our and say it I sprayed Lawn Weed and Feed on everything. Please no lectures I feel bad enough having to watch all my plants deteriorate slowly over the past month and a half. So now for the good news, while some of my flowers have died my impatiens are doing very well, and my hydrangeas will live to see a better year in 2009. 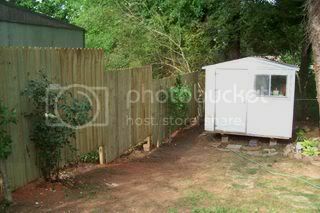 My husband finally decided to put up a privacy fence. 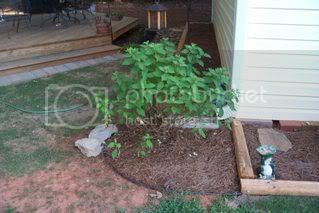 I have planted azaleas I got from work along the back fence and I decided to move my ailing hydrangeas to a spot with a little more shade from this Alabama sun. I took the chance to till up the hard clay and work in composted manure and leaves so the azaleas I planted and hydrangeas I replanted would have a better chance at growth. This next picture has a lot going on. 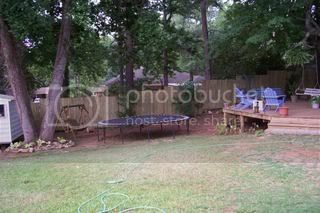 To the far right is a new bed I built a few months ago along the side of the shed, I have yet to decide what to put in it. 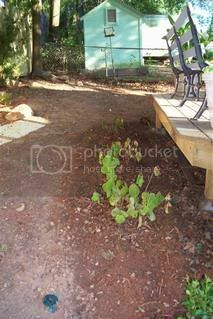 The left side is a grouping of Elephant ears that I planted down this side of the deck; they are recovering from my mistake also but doing well. 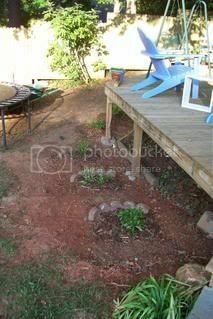 The middle was my husbands handiwork, he laid the rocks and I filled in between them with dirt. I then transplanted some moss that I hope will fill in the gaps. 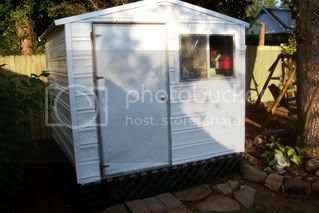 I just got done painting the small shed and attaching lattice to the bottom. I am going to add a bush or maybe a clematis to the right of the door below the window for a little color. I will write more as soon as I can. I'm so sorry to hear about your plants, but that's gardening for you. Accidents happen. I've often been told that our plants should have been equipped with wheels, since we're moving stuff around all the time. 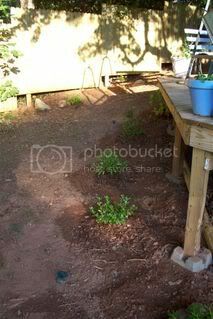 Your place is looking good, I'm glad most of your plants came through OK.
tHANKS FOR THESE UPDATE PICS....WHAT A CHANGE! Your place is looking really good. You have done lots of great work there. The fence is a beauty. It sounds like you did a really good job with preparing the ground and replanting those azalias. Justr don't forget top water them copiously for 2-3 weeks after planting to ensure their survival. 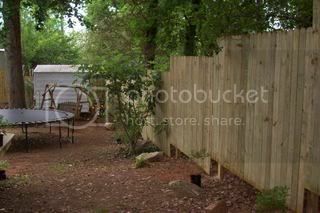 Your yard is looking great! 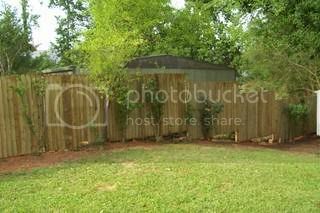 I would put a window box planter on the shed. I think that would really set it off.